This was supposed to be the 'July 4th Special' for this year but it didn't quite fall on the holiday, so we're going to do it the Saturday after and just say it counts. 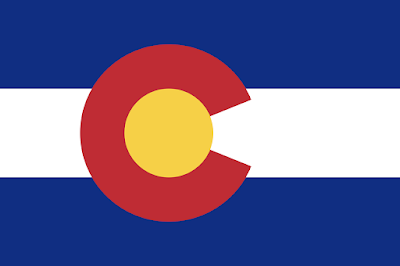 We went to Colorado on vacation this year, so it should come as no surprise that This Week In Vexillology, we're going to feature the flag of Colorado! Before we get into the nitty-gritty of the flag of the Centennial State though, we gotta talk about that infamous 2001 NAVA Survey. Colorado ranked 16th. I'm sorry, but that is way too freakin' low. I mean, don't get me wrong- it's not bad. It's not a total miscarriage of justice, but it's still, way too freakin' low. The NAVA Survey looked at Canadian Provinces, US Territories and all 50 states and D.C. so the sample size is a little bigger, which I'm willing to make allowances for. But honestly: in terms of state flags, Colorado ranks right up there with New Mexico, Texas, and Arizona as iconic flags of state vexillology. At the end of the day, this is one of my favorite state flags. I'm sure we're going to get back there one of these years and when we do- I'm going to track one of these bad boys down and add it to my collection. There aren't many state flags that I want to add to my collection and Colorado is probably pretty damn close to the top of the list. Meanwhile, until next time, keep your flags flying- FREAK or otherwise!